Having been lucky enough to be shortlisted for Best Legal Service in the Recruitment Industry Awards this year we have entered again for 2018. 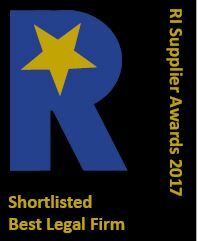 The RI Recruitment Industry Supplier Awards are especially prestigious as they give companies the opportunity to be voted the best in class by the recruitment industry itself. These awards are highly coveted because they are completely independent and a true reflection of standards. It will be our clients and the recruitment agencies themselves who are the judges. They will answer questions online and this will determine the winners. We strive to provide our clients with outstanding levels of service and are delighted to have this reflected in next years entry.